It's a girl, my Lord, in a flatbed Ford, slowin' down to take a look at me. Take It Easy - I'm only quoting the famous Eagles' song. The town of Winslow decided to take advantage of their fame and create the "Standin' On The Corner Park." Notice the Eagle up in the first window. And there's some hanky-panky going on up there too. The town is also famous for being on historic Route 66. It runs right in front of the Park. Notice that isn't really a building, just a wall. It used to be a building, but it burned down in 2004. Fortunately, the wall and mural were saved. Just down the street, La Posada Hotel was the last great railroad hotel for the Santa Fe Railway. Designed by Mary Colter and opened in 1930, it closed in 1957. It has now been restored and caters to Route 66 fans. The railroad is just outside these gates. The hotel is filled with all sorts of strange modern art and paintings. This 18' by 7' painting is "A New Years Party in Purgatory for Suicides in which Liberace Makes a Guest Appearance Down from Heaven Just for the Hell of It," by Tina Mion. You can put on a party hat and join in if you would like. You can read her explanation, along with who all's in the picture, here. But at least they had some rusty stuff! Sometime around 1100 AD, after Sunset Volcano was done erupting, some early ancestors of the Hopi, Zuni, and Navajo people returned and settled here, just 15 miles from the volcano, near present-day Flagstaff. The thin ash layer from the eruption absorbed moisture and increased crop production. There are other ancient pueblos in the area, but this is the biggest. Notice how they used existing rock as walls and floors when possible, and incorporated sandstone blocks to complete the rooms. This is how it originally looked. I thought the parrots were odd, but I did some Googling and found out they did have parrots here, having traded for them with the ancient Toltecs from present-day Mexico. With over 100 rooms, this ruin is believed to be the area's tallest and largest structure for its time period. And a ceremonial ballcourt is down the hill. One of the other pueblos in the National Monument is called Wukoki. It looks like a ship, and is visible for many miles around. Here, too, the masonry is incorporated with the natural rock. You're allowed to go into the rooms here. Wow! Those ancient ones must have been pretty short! This is one of the several National Monuments in the Flagstaff area that I had never been to. The lava was really spectacular, with green lichen growing on it. Trees seem to sprout up right in the middle. Sunset Crater is the most recent volcano of the many in Northern Arizona. It erupted sometime between 1040 and 1100 AD. In the Visitor's Center is a volcanic rock with impressions of small ears of corn in it, showing that the eruption forced the ancient people to move elsewhere. The largest of the volcanoes was San Francisco Peaks. It used to be one 16,000 foot mountain, but is now several peaks. The largest, Humphreys Peak, is now the highest point in Arizona at 12,633 feet. Outside the monument is the Cinder Hills OHV Area, where ATVers and Dirt Bikers can climb the cinder cones to their hearts' content. There is also free camping there, if you don't mind the noise. But Flagstaff is surrounded by National Forest land, and lots of quiet free camping among the Ponderosa Pines. You'd think after all these years of RVing, I'd be done with the Grand Canyon. But I never tire of it! This is the view from Pima Point, one of the stops on the free shuttle bus. That's Granite Rapid down there. It looks pretty mild from here, but it isn't - it rates an 8 on the Park's 10-point scale of river difficulty. Hermits Rest is the turn-around point for the bus. Where I tried to do a movie. It looked better in person, though. Then on to Powell Point. That's the 440-foot suspension bridge that takes hikers and mules across the Colorado River to Phantom Ranch and to the trail up to the North Rim. And that is Phantom Ranch, where there are cabins and a campground for hikers. Late in the day, just before sunset, we went to Mather Point. The colors are much more brilliant then. On the way home, ran into an elk jam. This poor little elk was just trying to cross the street. She finally did make it over to where her friends were. An Easy Way to Make a House? Walnut Canyon is a National Monument just east of Flagstaff. There are hundreds of archeological sites in the canyon, and the Island trail takes you by quite a few. It's a short 1-mile loop after you descend 240 steps. Looking across the canyon, you can see dwellings sheltered by overhanging cliffs that were home to Walnut Canyon's inhabitants from 1400 to 800 years ago. This was really the perfect shelter. For each room, nature provided the back wall, floor, and leak-proof ceiling. Builders simply provided unshaped blocks of limestone for the side walls, enclosed the front, and opened their doorway to the canyon. Some of the dwellings have been reconstructed, and some have not. Unfortunately, after your loop trek, you need to climb up those same 240 steps back up to the visitors center. At 7000 feet, this is no easy task. Even closer to Flagstaff is the Elden Peublo, located right on Route 66. How did they know? The Sinagua people settled here at higher elevation in A.D. 1070, probably due to the eruptions of Sunset Crater, 10 miles away, and stayed until 1275. And on a totally unrelated subject, I'm now a professional photographer! 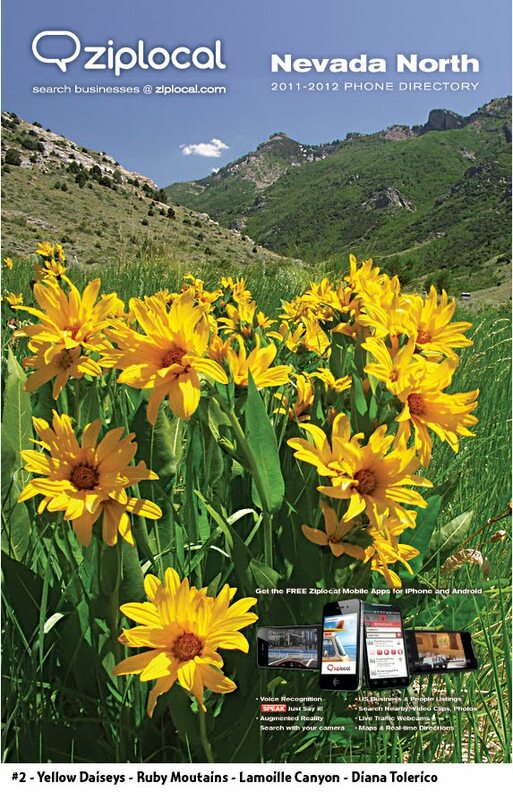 One of my photos has been chosen to be on the cover of the Elko, NV phone book. And they paid me for it, so that makes me a professional, right?